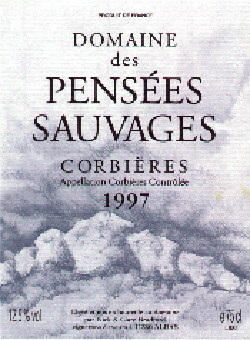 Terroir : Central Corbières, Mediterranean influence, at 225-325 metres above sea-level. Four different soil-types: schist, limestone clay, clay and red sandstone mix, marl. 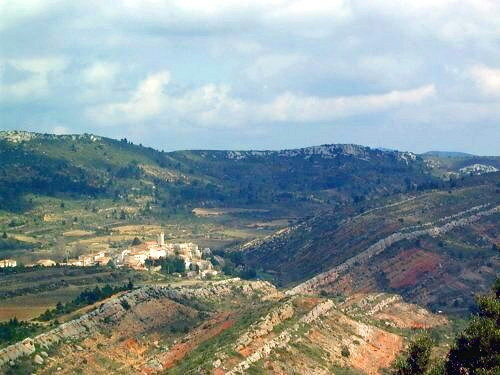 Hillside vineyards surrounded by rosemary and green-oak scrub. Vinification : Manual harvest, destemmed, uncrushed; steeped for one month with daily soaking of the manta. Domaine des Pensées Sauvages is the mi-life creation of Nick Bradford, ex-anthropologist and his wife Clare, a potter. Our terroir : a Mediterranean climate attenuated by heights above sea-level of 225 - 325 meters; an extraordinary array of soils - fluviatic red sandstone, sedimentary shale, lacustrian limestone, and many kinds of marl. Twenty-five acres of scattered hillside vineyards surrounded by rocks and scrub of juniper, holm oak and rosemary; century-old Carignan, youthful Syrah, some Grenache and Cinsault. 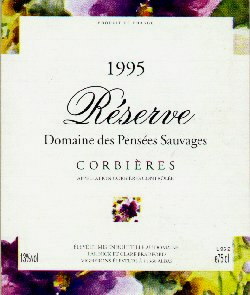 Our wines show their origins. Nothing is done to mask either terroir or vintage. No adjustments to acidity, no manipulations of sugar levels or malolactic fermentation are countenanced in our cellars. Apart from minimum levels of anti-oxygents, no additives are used, either at the vinification or the bottling stage. Our wines are deeply coloured and firmly structured. In their early days they are marked with a spicy (pepper, cinnamon) and herbal ’garrigue’ nose, and by flavours of black fruit (cherry and blackcurrant). Later they take on notes of musk, smoked meat and dried fruits. Although they can be drunk relatively young (especially as an accompaniment to gamey, spicy dishes), they are at their beat after a good five years in the bottle. Our annual production of 10 - 15,000 bottles is sold mostly to restaurants, wine boutiques and individuals. Our tasting cellars, and exhibition of pots, are open throughout July and August except Sundays, from 15:00 - 19:00 and at other times by arrangement. Footnote : Nick & Clare have retired and the Domaine des Pensées Sauvages has been sold therefore their wines are no longer available, to date no information on the new proprietors has been received, it is not known if they make wine or even trade under the same name.